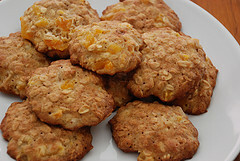 Recipe for Coconut Oat Cookies made with flour, peanuts, flaked oats and dessicated coconuts. In a mixing bowl, put in flour, peanuts, oats, coconut, sugar and salt. Mix well. Melt margarine and golden syrup over low heat. Add to dissolved bicarbonate of soda. Blend well. Stir into the dry ingredients, mixing well. Drop by teaspoonfuls onto greased baking trays. Bake in a preheated oven at 375F for 15-20 mins. or till golden brown. Read Reviews and Compare Bakeware sets . Cool on a wire tray. Serve or store Coconut Oat Cookies in airtight containers.